Chi bosses Miles Rutherford and Graeme Gee, whose first game in charge came against Shoreham in the autumn of 2015, went with the 11 players that featured in a second half comeback victory at Lingfield last time out. It’s been a season of contrasting fortunes for Chichester and Shoreham. City came into the match on the back of six straight wins in an unbeaten run of 19 games, whereas the hosts hadn’t won in ten. It was a different story two years ago when league runners-up Shoreham were promoted to Step Four for the first time instead of champions Haywards Heath who had nine points deducted. That season Chichester were in the mix for the title too but their promotion push unravelled in April and they finished in third place. Shoreham were relegated after one season in the Bostik league. This campaign has been another challenging one with Dale Hurley and assistant Matt Langley the third management team to take the helm at Middle Road. 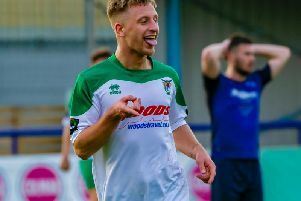 Here, things didn’t start well for the home side when City striker Scott Jones followed up a shot that hit the bar and slotted the ball away with barely three minutes on the clock. It might have been 2-0 moments later but this time Jones struck his effort into the hands of keeper Rui Buckland. Captain Connor Cody then broke a couple of challenges driving into the box only for Buckland to gather again. A cheeky rabona from Josh Clack teed up Gicu Iordache but the Romanian drilled his shot inches wide. Shoreham equalised from the spot after referee Paul Hitchcott, who waved away appeals from Chichester players after sixty seconds when Jones was impeded, awarded an odd penalty. Mohamed Diallo tucked his kick away past Ryan Young for his team’s first goal in six games. The Musselmen weren’t level for long and Jones added a second in the 20th minute with a clinical finish following Clack’s set-piece. A super pass from Emmett Dunn next sent Kaleem Haitham away only for Haitham to drag an attempt off target. At the other end a mix up at the back presented James Beresford with a golden opportunity but Young made a fine save. Just before the half hour mark Cody had a shot blocked before mayhem in the box saw a Shoreham defender turn the ball against his own post. Rory Biggs, who put in another shift in the centre of the park, Haitham and Rob Hutchings caused further trouble in Chi’s next three raids and then Ryan Peake headed an Iordache corner narrowly over. And in time added on Iordache forced a smart save out of Buckland. Terrell Lewis came on for Hutchings at the break in a straight swap. Haitham wasn’t far off with a shot from distance in Chichester’s first attack before the tricky winger’s pinpoint cross picked out Jones. City’s top scorer wasn’t going to miss from there and he found the back of the net with a well-placed header for a second hat-trick in three games. A bizarre own goal made it 4-1 on 51 minutes and Rutherford and Gee rang the changes, introducing Sam Ndlovu for Jones and Harry Williams for Biggs. Diallo might have pulled a goal back but blazed over. Next Clack flashed a header against the woodwork after a slick move involving Haitham and Iordache. Another slip-up gifted the visitors their fifth and Clack had the easiest of tasks for his fifteenth of the season in all competitions. He might have added to this tally but for a good stop from Buckland and a goal-line clearance with quarter an hour to go. The Oaklands Park outfit might not have long to wait now to clinch - just one point will do it. Results elsewhere impacted the title race. Lee Robinson's 95th minute equaliser salvaged a point for Newhaven against second placed Horsham YMCA but the Dockers dropped to fourth after Eastbourne Town's 2-0 win at Hassocks. Given the goal difference situation, with Chi close to 100 league goals this campaign, YM, the only side that can catch City, would have to score some 20 goals more than the league leaders in the run-in and hope the champions-in-waiting don't grab another point. The Chichester chairman might have the champagne on ice, and a nice bottle of white wine for his wife, but he’ll wait a little longer for things to be decided before celebrating with everyone at the club. Chi return to Oaklands Park on Saturday, April 6 and face Langney Wanderers in their last-but-one home game of the season (3pm). Chi City: Young, Peake, Hutchings, Dunn, Cody, Pashley, Clack, Biggs, Jones, Haitham, Iordache. Subs: Williams, Axell, Lewis, Ndlovu.